Birthday wine gifts, wedding wine gifts, anniversary wine gifts, corporate wine gifts, Christmas wine gifts, 40th, 50th, 60th birthday party wine or brandy gift, presents for men, presents for women, – You will find that The French Wine People have a present for every occasion. 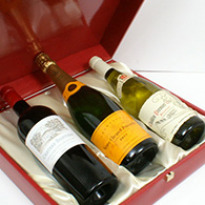 Our quality wines, champagnes and spirits gift packs are available individually or wholesale. 1940, 1950, 1960 1970, 1980 are among the years currently available. Please click here to contact us for an e-mail order, a quotation for bulk orders or bespoke packs. All items are also available using our secure basket.